Bali’s iconic reef breaks are the embodiment of perfection. Surfers and non-surfers alike flock to the island to catch a glimpse of local and international pros taking a stab at legendary waves like Padang Padang, Uluwatu, Impossibles, and Bingin. But such perfection comes with a price. The waves in Bali are often crowded and places like Kuta and Seminyak are already suffering from mass tourism and over-development. 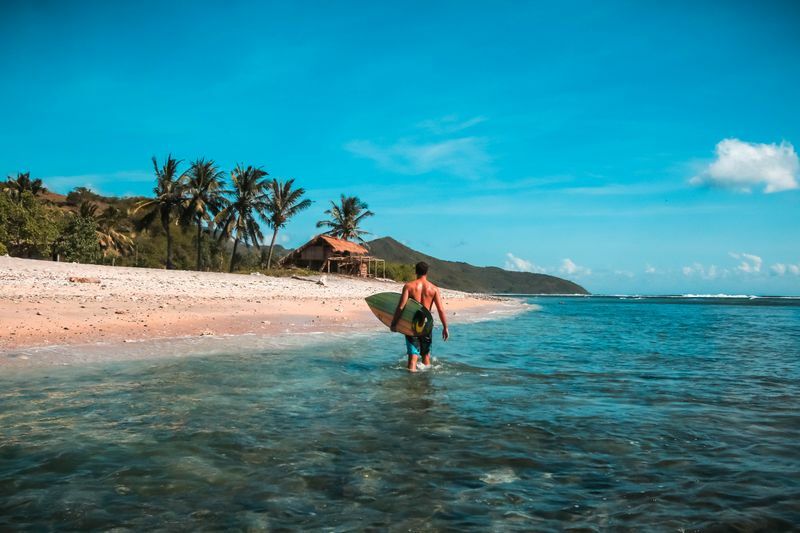 Its next-door neighbor, Lombok, however, is the go-to destination for all those travelers and surfers who’ve been put off by the growing influx of tourists in Bali. So, should you choose a surf camp in Bali or a surf camp in Lombok? The two are often compared; they have their similarities but many differences as well. Let’s break them down. Bali is the epicenter of surfing in Indonesia. And it’s easy to see why. Pictures and videos of its perfectly peeling and barreling waves have traveled around the world. Their reputation precedes them. 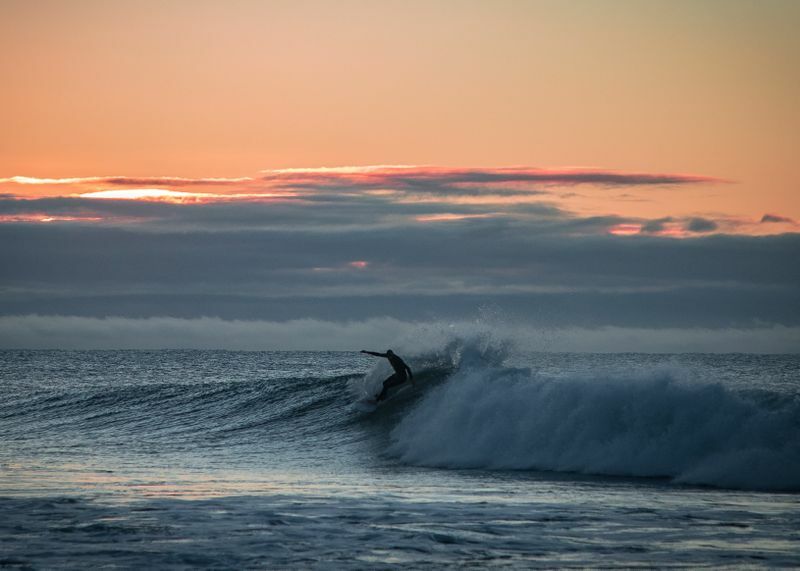 It is the place to go to live and breathe surfing. There are numerous surf camps that offer personalized lessons, great accommodation, and overall exciting experience. You’ll see surfboards at every corner. In the beach towns, people go about wearing only board shorts. Motorcycles are equipped with surfboard racks, and so are most of the bars. Before the 1971 landmark surf film, Morning of the Earth, surfing in Bali was only known to a handful of surfers. After its release, the floodgates opened. Since then, its popularity just kept on growing. Today, Bali has a very active party scene, with most of the action concentrated in budget-friendly Kuta and upscale Seminyak. It is a renowned yoga destination, with numerous retreats being held in the island’s spiritual capital, Ubud, as well as in beach locations like Canggu. 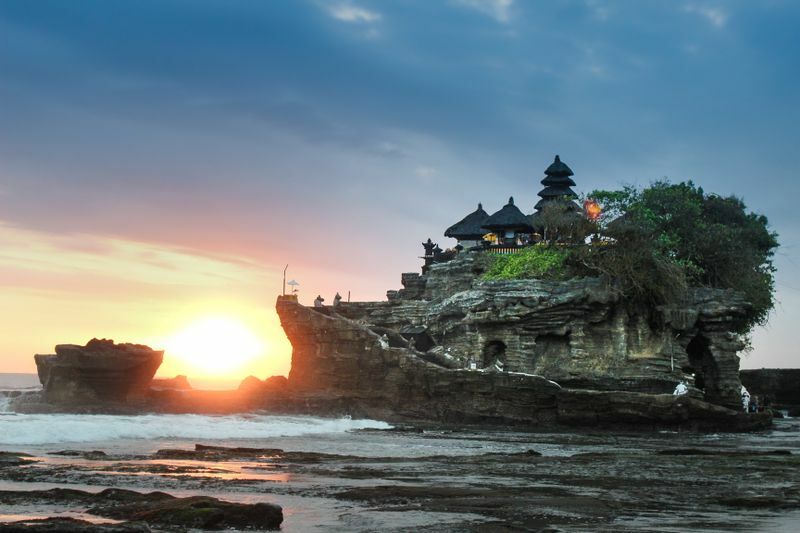 Bali is also known as the “Island of 1,000 Temples”. The predominant religion is Balinese Hinduism, a blend of Shaivism and Buddhism. Hence the colorful offerings, temples, dances, and shrines at every corner on the Island of the Gods. Cows are considered sacred, so beef is not consumed. Despite being busy and touristy, Bali has a unique vibe that can really grow on you. It is an interesting contrast between spirituality and Western culture, patty fields and sandy beaches, lush jungles and colorful coral reefs. Interested in surfing on the Island of the Gods? Find all you need to know about planning your surf trip to Bali. A 30-minute flight east of Bali, Lombok has a back to basics charm. It is less busy and much quieter, thus the island appeals more to adventure travelers and backpackers. White-sandy beaches with crystal-clear turquoise water are Indonesia’s trademark. Lombok has more virgin beaches than Bali, and they are postcard-perfect. The beachfronts are not packed with bars and restaurants. 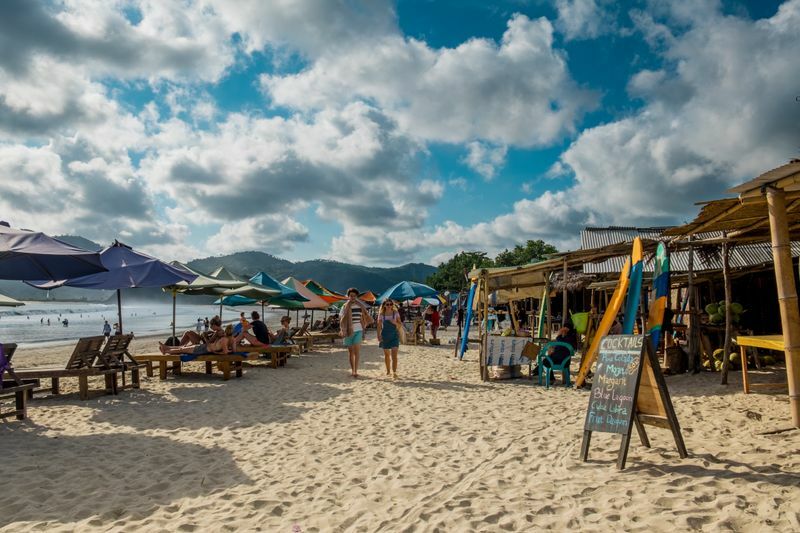 Instead, you’ll find the occasional warung to refill after a surf session. These are small family-owned eateries serving traditional fresh and cheap Indonesian food, like the emblematic nasi goreng (Indonesian fried rice with meat). Remember – Lombok is not Bali, and you need to set your expectation straight. Also known as the “Island of 1,000 Mosques”, its population is mainly Muslim, and this is obvious at almost every step. The indigenous Sasak people make up around 85% of the island’s population. You’ll get the chance to witness some unique cultural events and traditions, as well as sample Sasak food, which is quite spicy and surprisingly vegetarian-friendly. The cuisine has different influences in Lombok, where pig is considered dirty and is not eaten. They do eat beef. The nightlife is not as active and the locals are more conservative. Also, wearing swimwear outside of the beach can be seen as offensive. Yes, Lombok has its very own Kuta too. Same as Bali’s, it is the starting point for your surfing adventures on the island. But that’s pretty much where the similarities end. 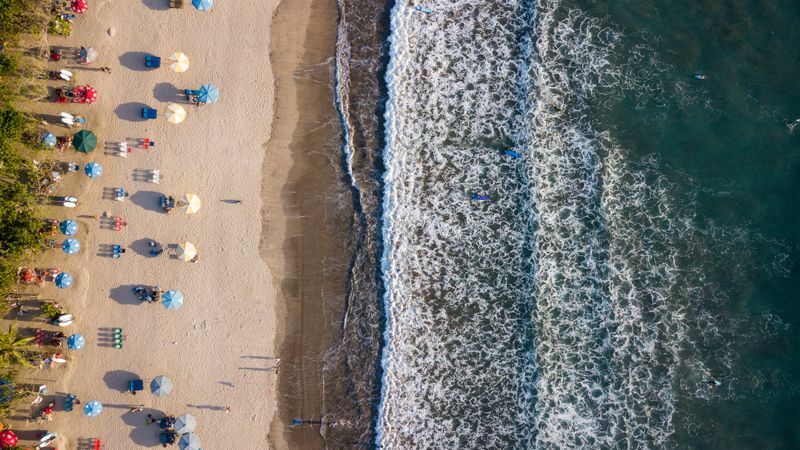 In the south of Bali, Kuta’s surfing potential was first explored in the late 1930s, but it wasn’t pinned on the international surfing map until the 1970s. Today, it is Bali’s primary resort town, particularly popular with Australians. 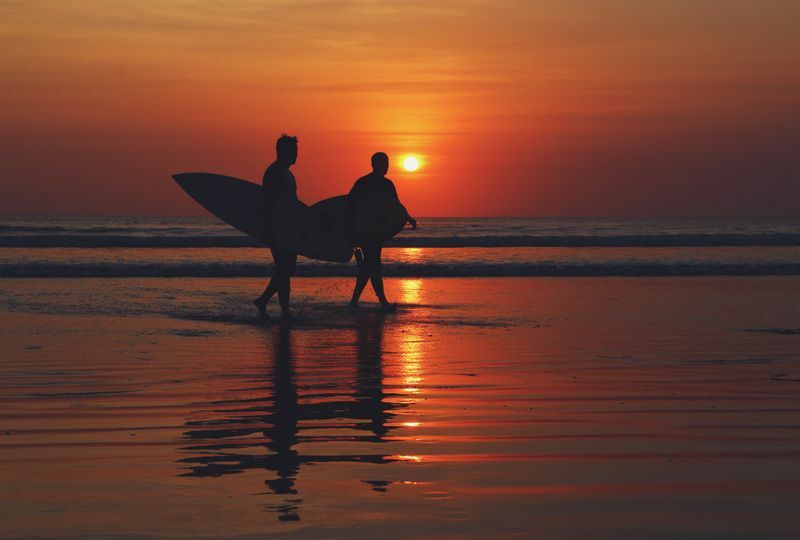 Kuta is the gateway to the surf spots on the Bukit Peninsula, as well as the surf beaches north – Seminyak, Legian, and Canggu. Kuta is known as Bali’s party capital. Its long beachfront is lined with hip cafes and bars, nightclubs, surf shops, and boutiques. In recent years, it has also gained a reputation as being crowded and rather dirty. Traffic jams are the norm. Therefore, the best way to get around Kuta is by walking. As long as you don’t have to cover long distances, of course, in which case a taxi would be the best option. The five-kilometer (3mi) stretch of beach at Kuta offers one of the best sunsets in southern Bali. Many travelers will be fighting for a front-row seat at the show. While it is crowded and rather loud, it’s definitely something to witness at least once in your lifetime. The waves here are the most beginner-friendly in Bali, and this is one of the few beach breaks on the island. Therefore, there are numerous surf camps in Kuta offering lessons. As there is only so much room in the water among the surfers and swimmers, Kuta Beach is usually packed. Simply put, Kuta is not for everyone. You either love it or hate it. If you’re a party animal who likes to surf by day and dance by night, not minding the crowds, then it could be for you. But if you’re looking for some quiet time on a pristine beach, you’ve come to the wrong place. For something more laid-back but still close by, you can opt for trendy Canggu. Lombok’s Kuta is very different from Bali’s, and let’s hope it stays that way. In the south of Lombok, Kuta has a more local vibe. It is more laid-back, smaller, and much less developed. Don’t get me wrong, there are still plenty of tourists, but there aren’t any huge hotels and none of that mass tourism that is currently devouring Bali. Furthermore, the traffic is very relaxed. The best way to get around Kuta Lombok is via scooter, and you should be comfortable with that idea. 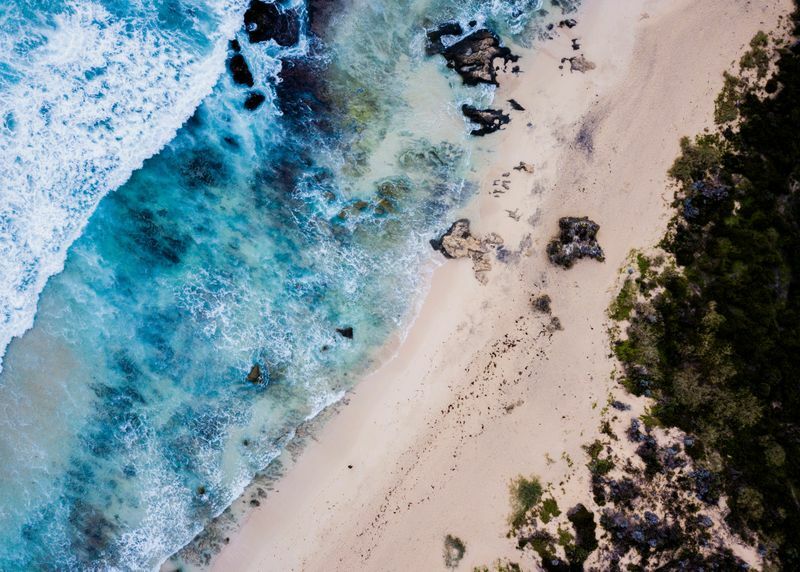 Within a 40-minute drive from Kuta, you can access the most popular surf spots on the south coast of Lombok, the likes of Gerupuk, Ekas, and Mawi. In terms of costs, Kuta Lombok is slightly cheaper, but the differences are not that big. Its restaurant scene is starting to emerge, and you’ll find a few eateries that are just as hip as those in Canggu. 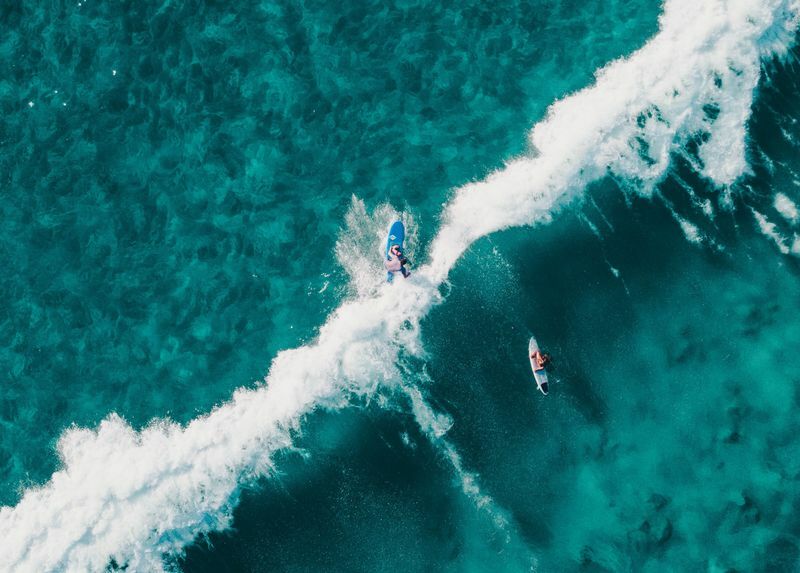 Oh, where to start… The most famous surf spots in Bali are concentrated on the Bukit Peninsula, where legendary reef breaks like Uluwatu, Bingin, Padang Padang, and Dreamland are on every serious surfer’s bucket list. Let’s pause for a reality check. Most of those awesome waves in Bali are too darn difficult. You need to have enough experience under your belt (and the stomach) to challenge them. Sure, there are waves in Bali that are more accessible. But they’re usually crowded, and you might find yourself battling with dozens of people in the line-up, getting dropped-in many times (not everyone cares to learn or practice good surfing etiquette). If you’re okay with all of the above, then surfing in Bali promises the adventure of a lifetime. 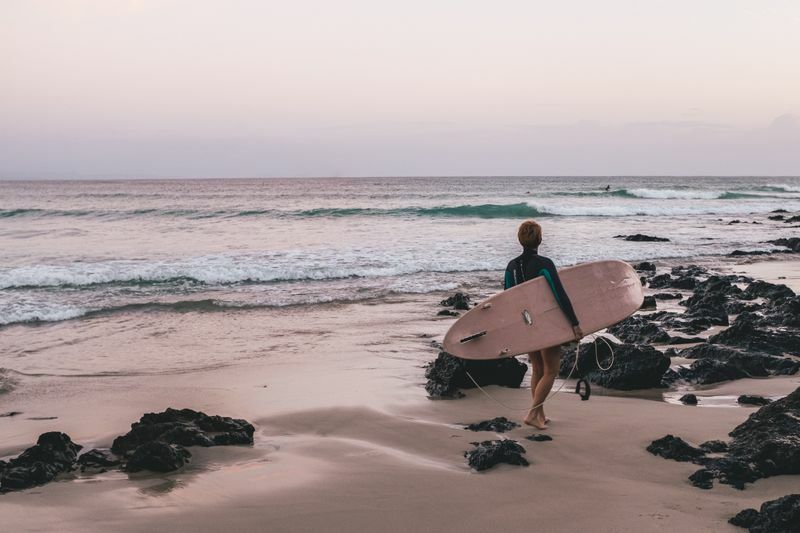 Furthermore, the island’s southern coast is dotted with surf camps and surf shops, so you don’t need to bring along any gear. Lombok doesn’t have Bali’s outstanding concentration of world-class waves. After all, there can be only one Bukit Peninsula. However, if you’re a beginner or intermediate surfer, Lombok is often considered a better choice. Why? Because you can actually enjoy learning to surf. The waves can look big and somewhat intimidating at first, but they break slowly and usually move over the reef for a long time. This means that you have plenty of time to get up and ride the wave. For beginners, this is ideal. Plus you don’t have to compete against god knows how many other surfers for a wave. Don’t be mistaken – the surf spots are less crowded and quieter than Bali’s, but they can still attract a crowd. It never gets too crazy, though. 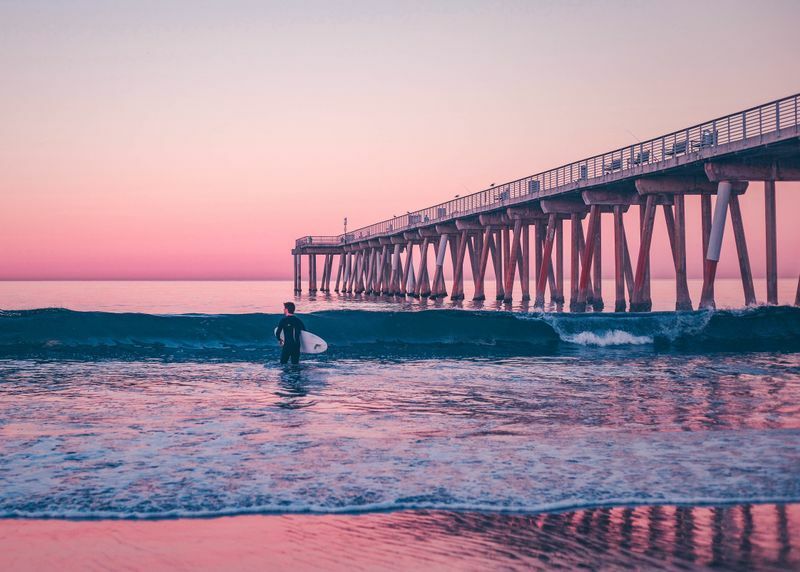 Most of the surf breaks are found in large bays, with several peaks to choose from, offering different conditions depending on the swells and tides. Instead of going out from the beach, to get to most of the reef breaks in Lombok you have to hop on a surf charter or a fisherman boat. If you join a surf camp in Lombok, they’ll take care of all these details. It may not have as many waves as Bali, but Lombok does have a few that draw attention. The surf at Gerupuk is among the most spectacular on the island. The waves at Ekas hardly ever get crowded, and Mawi is a swell magnet that works all year round. Desert Point, also known as Bangko-Bangko, throws some of the longest barrels in the world, with tube rides of over 20 seconds having been recorded here. As opposed to Bali, where you can easily rent or buy surf gear once you get there, the options are limited in Lombok. If you don’t join a surf camp, it is recommended that you bring your own equipment. So, which one should you choose? It all depends on what you’re expecting from your surf trip. If hip bars and wild parties are on your agenda, then Bali is the obvious choice. If you’re looking for a less crowded and a more authentic Indonesian surfing experience, then Lombok could be the answer. To make sure you don’t miss out on anything, why not check out both? 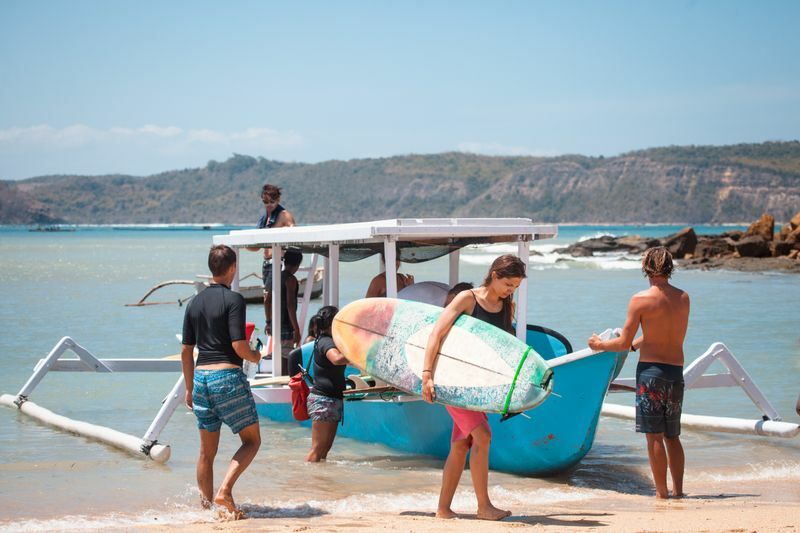 Go on a surf camp for beginners in Lombok or in Bali.